This is a watercolour bed quilt is depicting the four seasons of the year . All my watercolour quilts are made from 2" squares . 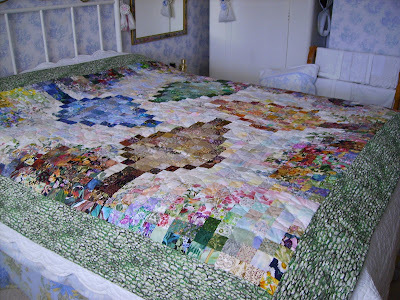 This quilt was made of several blocks before joining them altogether . the red tree has summer coloured flowers, the green tree spring, the blue tree is winter , and the brown autumn . T o get a diverse amount of colour and pattern for the watercolour effect I had to use furnishing fabrics as well as regular patchwork fabric. Dear friend, this one is amazing!! Stunning comes to mind too. This quilt is just beautiful! I first thought it was 4 different quilts, and then I saw the picture of the whole quilt. WOW!